We, Agrawal Metal Works, are an ISO 9001:2008 organization involved in manufacturing, supplying and exporting a commendable range of Hardware Fittings, since 1976. 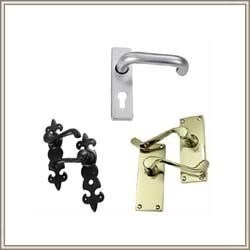 Under this range, we offer Lever Handle, Door Pulls, Door Knobs, Window Fastener, Window Stay and Cabinet Knob. Along with this, we offer Suffolk Latch, Hand Forged Hinge, Hand Forged Pull Handle, Curtain Finial and Carpet Finial. All our products hold several attributes such as longer service life, resistance against corrosion, sturdy construction and efficiency. Owing to the aforementioned features, these offered products can go well with decor of offices and homes. The entire production process of these products are carried out in accordance with the defined parameters of the industry. To meet quality standard we manufacture these products by making use of high-grade raw material, procured from the established vendors of the industry. Keeping in mind divergent demands of the clients, we offer all our products in different sizes and designs. Products that we have up with precise designed while taking into consideration market demands. Furthermore, we facilitate our valued clients with customization services as per their requirement.